From 20 November to 6 December 2011 I paid an official visit to the SMA in Kenya on behalf of the General Council. 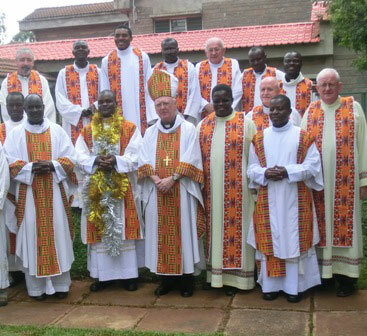 There are a total of twenty-three SMA members living in Kenya: three are involved in the Administration of the Great Lakes District-in-formation; four are staff members at the SMA Formation House, and the remaining sixteen are involved in pastoral work in the Region, including the Regional Superior, Fr Fabian Hevi (from Ghana). During my two-week visit I met all 23 of these and four other SMA members who were in Kenya at the time. While visiting the Formation House I had the privilege of receiving the Final Oath of permanent membership of the Society of Felix Namusonge and to be present as Bishop Patrick Harrington SMA ordained him to the diaconate. Felix has since left for pastoral work in Angola. Our picture shows Rev Felix (garlanded) and Fr Thaddeus Ogato SMA (Superior of the Great Lakes District-in-formation) on either side of the Bishop. Fr Curran is on extreme right of picture. The visit gave me the opportunity of seeing at first hand the variety of work that our members are engaged in. Each is engaged in some aspect of the apostolate, seeking to bring the message of Christ’s love, the Good News to the people of God in this part of Africa. These activities range from Primary Evangelisation (in areas where the Gospel has not yet been preached), pastoral work, hospital chaplaincy, seminary formation, theology lecturing, conflict resolution, schools building and administration, counselling, food distribution, community development, SMA administration and hospitality. This wide range of action reflects how mission is today and responds to the church’s call to use all the different means to bring the message to the people. The SMA members I met come from nine different countries – drawing missionaries from the Irish and Dutch Provinces, and from the Great Lakes, the Bight of Benin, the Gulf of Guinea and Indian Districts-in-formation – reflecting the rich gift our internationality is for the work of mission as we can draw on a great heritage of experience and culture that enable us to be more effective in presenting the Gospel. My journey took me from Nairobi in the south to Lodwar in the far north-west of Kenya. It rained most days during my visit. This was most welcome especially in the Turkana desert area around Lodwar, where the green though sparse grasses, and the tiny white and yellow flowers, were a wonder to see in this usually barren countryside. Our picture shows the dryness of the land in Lodwar, despite the rainfall this year. 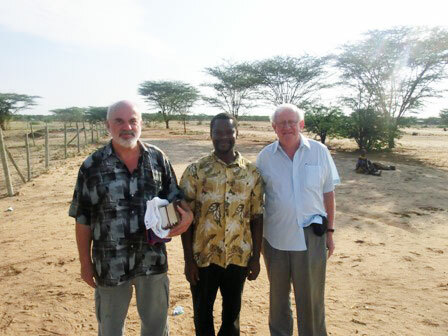 Our picture shows Fathers Ludwig van Bussel SMA (from the Netherlands), Edwin Mmasi (Tanzania) and Fr Curran. Drought is an ever-present reality with its consequent loss of harvests and hunger for the people. Another feature, brought on by the seasonal rains, are the “flash” floods which charge down through the dry gullies from the mountains of Uganda, rapidly cross the desert and empty into Lake Turkana and vanish as quickly as they come. My visit to the SMA in a remote part of Lodwar was nearly abandoned because of a flash flood, but after a one-day deferment, we managed to get through. Thank God. Throughout my journey I was in the capable hands of the Kenyan Regional Superior, Fr Fabian Hevi, who organised the entire trip and was responsible for the day to day logistics that enabled the visit to be successful. Everywhere I went I was received with warmth and with great hospitality by the SMA members and they shared, often from meagre resources, what they had to make me feel so very welcome. Please pray for our missionaries and support them in whatever way you can to enable the important work they do be fruitful in the promotion of the Kingdom of God. To find out how you can support our seminarians click here.